Like entering in a dream, this spectacle makes visitors immerse themselves into a unique experience of art, sound and light. The old quarries of the magical Val d'Enfer (Valley of Hell) in the south of France, have been hosting audiovisual shows for over 30 years. In Carrières de Lumières (quarries of light or enlightenment) you can enjoy classical paintings from an unusual perspective. Projection of Rêve, a fantastic trip that takes you to imaginary worlds, from futuristic metropolis and tenebrous abysses to the cosmic immensity. It was created by Gianfranco Iannuzzi, Massimiliano Siccardi and Ginevra Napoleoni. Image from the 2012 production presenting the colorful painting of Gauguin and Van Gogh. 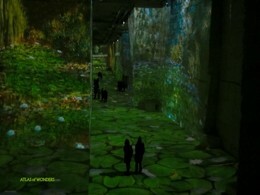 Virtual paintings from the 2006 projection dedicated to Paul Cézanne. The first one to discover the potential of this space, after the closing of the quarry in the thirties, was the fascinating artist Jean Cocteau. He filmed here his last movie in 1959, Testament of Orpheus. In 1977 the quarry was permanently opened to the public with the name of Cathédrale d'Images. Carrières de Lumières is located in the picturesque village of Baux-de-Provence, between Arles and Avignon. As we walked through these enormous caves, it was impossible not to have all of our senses sparking at full power.